Cemetery memorials provide a record of a person’s history, tell a story and serve as a permanent display of a person’s life. They are works of art handcrafted by talented artisans that show both hope and sorrow. Although the process and technology have changed since Oliver T. Korb founded his business in 1901, the third and fourth generation of Korbs continues to create the same product – stone memorials that can be found in cemeteries of central Pennsylvania that proved individual histories chronicling a community’s past. Like many business ventures, Oliver T. Korb’s entry was by chance. Oliver’s son Maxwell started working at the company in 1927 after having graduated from Georgetown University with a business management degree. Max’s brother Hugh also joined the family business in 1930 after studying granite work at a trade school in Vermont. The three Korbs worked together for quite some time with Oliver overseeing the operation, Max taking care of the business end and Hugh doing the technical work. Jim Korb explained that at the turn of the century, mining and working with granite was a cumbersome and difficult job. “Back when my grandfather and father worked with granite, it was split by hand,” he said. “You may notice that older cemetery markers are often much larger than ones made today. Since they were cut by hand, they were burly and much of the granite that was cut away was unusable. Today, modern machinery enables cutters to get the maximum use out of a large slab. Both Joe and Jim Korb also marvel at the ways in which their grandfather kept the business afloat during the Great Depression. He also recalls a story his grandfather told about a Korb salesman during the company’s slow period. Today, even though the product is the same, the process is quite different, and technology has paved a new path for memorial makers. But the Korbs believe this technology has driven away some of the industry’s true artisans. “Certainly our grandfather and father saw true craftsmanship,” Jim said. “Modern machinery has eliminated much of the craftsmanship of this industry. Technology has both enhanced our ability to satisfy customers and eliminated some of the art of this business. “This business used to use marble almost exclusively,” he said. “Now, granite is used almost primarily. Today, if you want a marble statue as a marker, you have to find an old Italian artist. They carve the marble by hand with a hammer and chisel, so it takes six to eight months to complete. 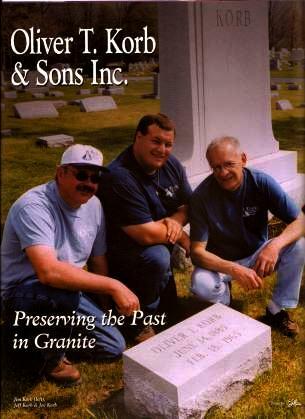 Prior to the 1970s, when both Joe and Jim joined the firm, some stones were still engraved by men with hammers and chisels. “With current engraving techniques, you don’t see much of the hand cut raised lettering, Joe said. “It is a dying art. Modern engraving is a technology that is effective, accurate and efficient, but people still request raised letters and luckily, I am trained to do it. He said 60 to 70 percent of people are not aware of the wide variety of stones that are available and the engraving and detail that can be added. “People are quite surprised at the detail that is available,” he said. “Diamond-point etching, in particular, offers the opportunity to create realistic, color portraits. People just don’t want a stone with a cross and flowers on it anymore.” Jim said the evolution of cemetery markers is illustrated by simply walking through a cemetery with stones spanning several generations. The markers often parallel the nation’s economic and social periods. Stones more than one century old are often ornate and grandiose and are marked with detailed statuary; their wording tells much about the deceased. Those a generation later are much smaller and quite plain, often with only a person’s name, date of birth and date of death. As the century moves on, the stones become larger and begin telling more about the person. “If you ever visit an old cemetery, you will find that 40 and 50 years ago, there were fewer people who went to college and who moved away from their family,” he said. “So entire families are buried together – maybe as many as 20 to 30 family members might be buried there. You can go to a family plot and learn a great deal about the family tree just by looking at the stones.